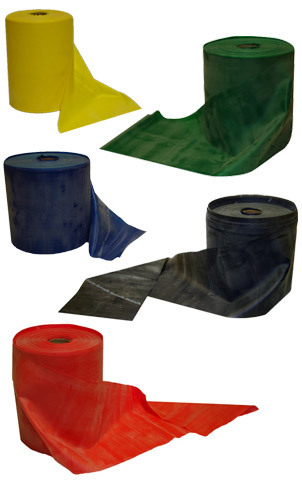 Never run out of your most effective workout gear when you invest in Yoga Direct's econonmical 150 Foot TheraBand Roll. The 150 feet of TheraBand rubber makes it easy to create bands in just the right length for your students and great for resale too. Recognized by the American Physical Therapy Association (APTA), TheraBands are versatile, lightweight, and when you cut your own bands from our 150-foot roll, they're cheap too! Thera Band Resistive Exercise Bands cost much less than other exercise equipment sold with claims of achieving similar results, plus they are portable and versatile with virtually unlimited uses. Recognized and used throughout the world, they are endorsed by the American Physical Therapy Association (APTA). With Thera Band Latex Band Systems, measuring progress and achieving goals for fitness or therapy is easier than ever before. Different resistance levels are determined by thickness of the band.